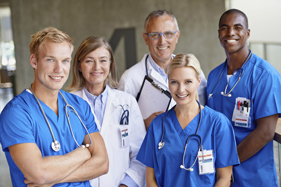 The need for allied health professionals in the workforce has never been greater. There are increasing professionals seeking careers in this field as well as health care providers seeking qualified help. We are happy to aid in this process. In fact, we have been offering the link between 'worker' and 'workforce' here for years. We have applied our experience in fields such as physical therapy, speech therapy and occupational therapy to place many able professionals with truly satisfied health care providers. Whether you are looking for full or part-time work, our schedules are flexible and we may just have the hours you are looking for. What your career needs is “on-the-job experience,” something you will get with FMA placement, plus the perfect resume builder and the skills needed to advance. If your skills, experience and qualifications warrant higher pay, then you will get it. Our wages are very competitive. We will make sure you are prepared for placement. Our training will help you acquire the knowledge and skills necessary to master your next opportunity. We are confident in our placements. If you are not satisfied, you will not have to pay. Our process for finding you the right candidate starts with a working knowledge of who you are looking for. We will not offer a one-size-fits-all candidate, we will take the time to find a candidate with the appropriate skills and experience. Save time. By tasking us with your human resources needs, you will be freed up to do what you do best. Finding a trustworthy Allied Health Professional requires a degree of discernment. That is why we require a background check, professional references and more.